I want to thank John Sommerson for motivating me and others to go out and climb! I have been thinking of what climbs I have done that rate consideration as the toughest climbs in California. It took one of my blog followers to remind me of one of the toughest climbs I have ever done– MINERAL KING! 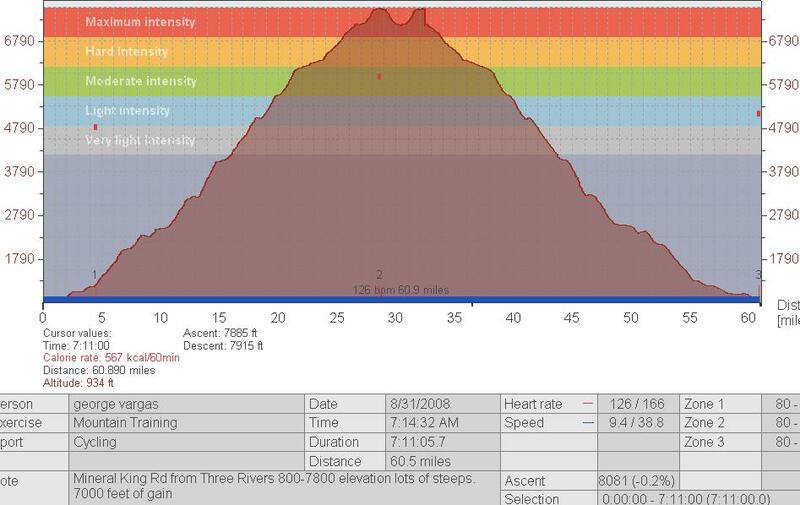 The stats for this climb are daunting just to read them– It is a 23 mile climb that gains just close to 7,000 feet. The real difficulty of this climb is there are continuous ramps that pitch up to 12% or more and then they flatten and then ramp then flatten then ramp then flatten and so on and so on. Just look at the graph below. You can never just sit and get into a rhythm and climb. You MUST get out of the saddle when you hit those ramps or your front wheel comes off the ground. Additionally, the road is tore up …and I mean badly. There are potholes and cracks all over the road which make picking a good line a challenge. And then there are the bugs and the heat and the sand traps and the narrow road and no guard rails with sheer 1,000 foot drops. All of these things combine to make MINERAL KING one EPIC climb without a doubt. I heard a term from one of the backpackers while I was staying at the Whitney Portal Hostel– Peak Bagging. I want to adopt and adapt that for my purposes. I want to become a summit bagger!! So here is my first of many nominations to California’s Toughest Climbs– MINERAL KING. This entry was posted in climbing, Epic Rides by REV Cycling Directeur Sportif. Bookmark the permalink. I’ve driven Mineral King. It was miserable. What people can’t possibly get from any article is the heat for the first 5000 feet or so, which slowly tapers and doesn’t get cool until you’re past that ranger station. I’m not going to ask about what crank you used. I couldn’t do Mineral King without a sleeping bag… how in the world do you carry enough water? On the Mineral King Climb I had a compact crank (50/34). It was two years ago (2008) and I wasn’t as strong a climber as I am today. I did it Memorial Day weekend (end of May) and it was already stifling hot. We had four bottles each and refilled at some garden house partway up the climb. I am also part camel. I will rarely if ever use a “camelback”. Today (6/20/10) I did a 5:20ish century with two bottles and 4 gels. I’ll post on that effort later.